This entry was posted on November 2013 by Rose Lanaro. 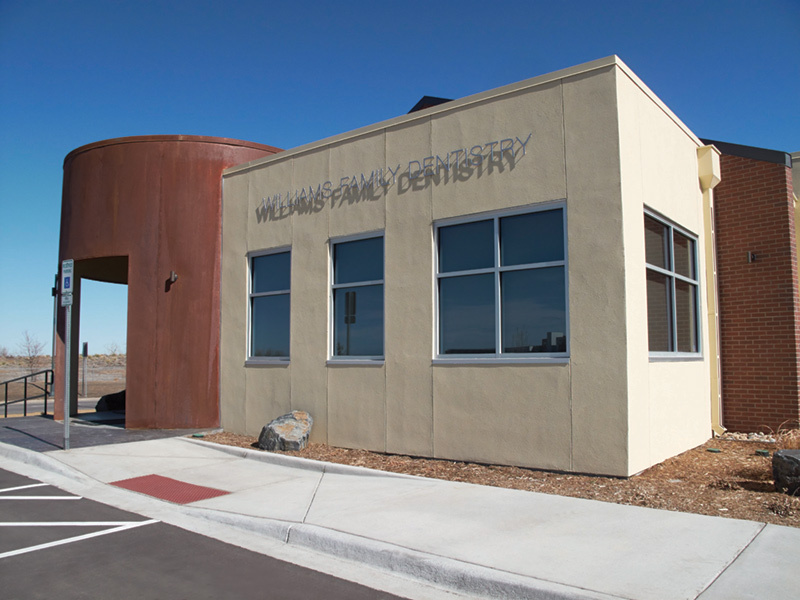 Located just 10 minutes from downtown Denver, Williams Family Dentistry is a modern-looking building with a dramatic rusted-metal rotunda. Dr. Margie Williams was what you might consider a “new” dentist when she opened Williams Family Dentistry. She had been practicing for less than two years at a nonprofit clinic when she opened her own office. However, she had years of experience in various other roles in the dental industry before she became a dentist: She assisted in her brother-in-law’s practice during her high school years, worked as a dental hygienist after earning her bachelor’s degree, and then became a Henry Schein representative after a serious fall injured her arm and prevented her from caring for patients. Eventually, after completing a lengthy rehabilitation, Dr. Williams decided to return to school and fulfill her lifelong dream of becoming a dentist. 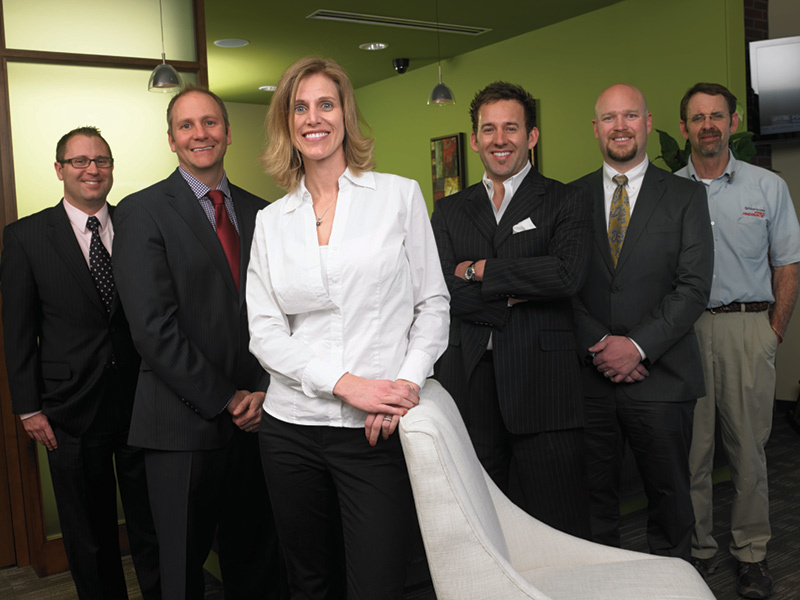 She opened Williams Family Dentistry in July 2012, and today it is a thriving 3,000-square-foot general dentistry practice with 800 active patients in the Stapleton area of Denver, just 10 minutes from downtown. 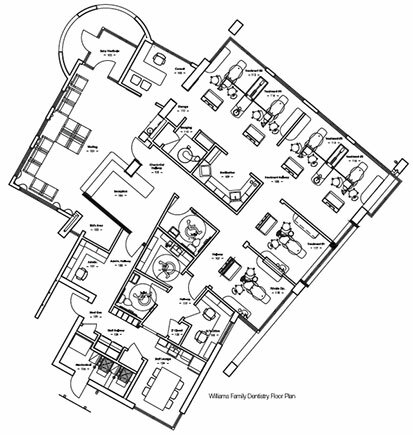 The new office quickly took off, blowing past Dr. Williams’ original one-year production goal within just 7 months of opening! Her dual perspective—as both a user of dental technology and a Henry Schein representative who consulted and trained dentists about the full capabilities of that same technology—was extremely valuable as she made decisions about the type of practice she wanted. 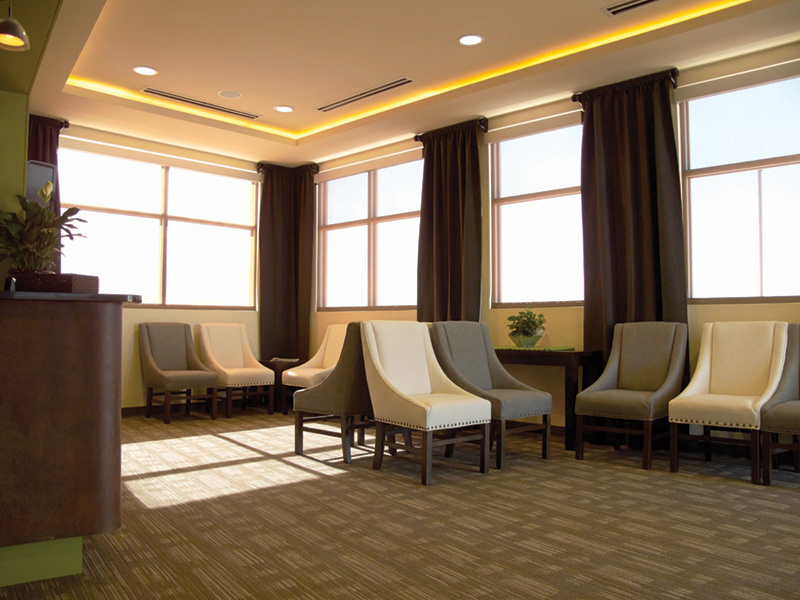 The waiting area, with its soft lighting and coffered ceiling, features upholstery, chairs, and carpets in warm brown and cream tones. “My office needed to have modern technology: no charts or film and the ability to adopt new technology over time, and patients who felt comfortable both in the environment and with the treatment decisions we made,” explains Dr. Williams. 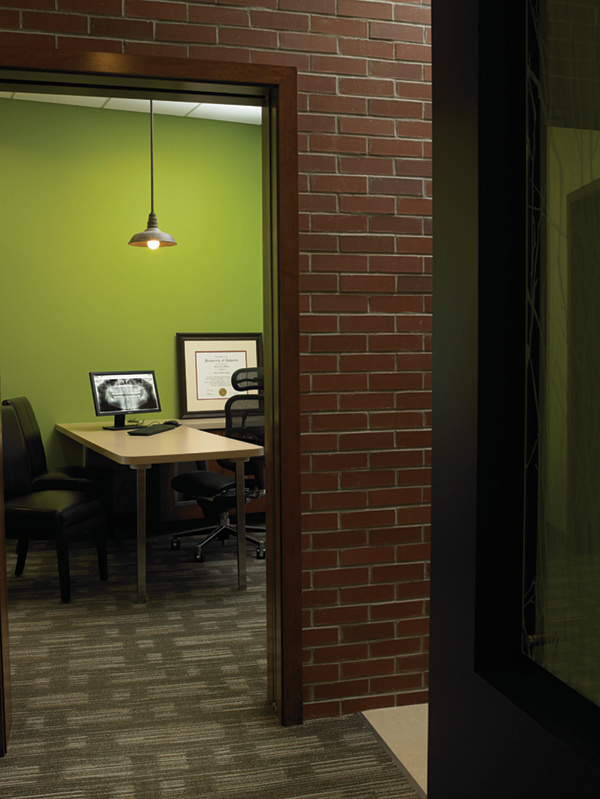 Exposed brick walls add to the warmth in this modern office. The practice was built from the ground up. Land prices were very competitive due to the real estate downturn, and there was a large inventory of commercial lots. In addition, Stapleton, a planned neighborhood that was being developed on the former location of Denver’s Stapleton Airport, was growing and was expected to add 15,000 new residents. However, existing dentists already had long wait times of four to seven months for appointments. There was a definite need for additional dental services in the area. So, the time and the location were right. “The location of the office has incredible visibility,” she adds. “We are easy to find for patients that live outside of our neighborhood, and we are in a prime location for the hundreds of local residents that commute to a nearby medical campus just a few blocks from our office.” The office is also very convenient for Dr. Williams, who lives right in the community, just two blocks away! 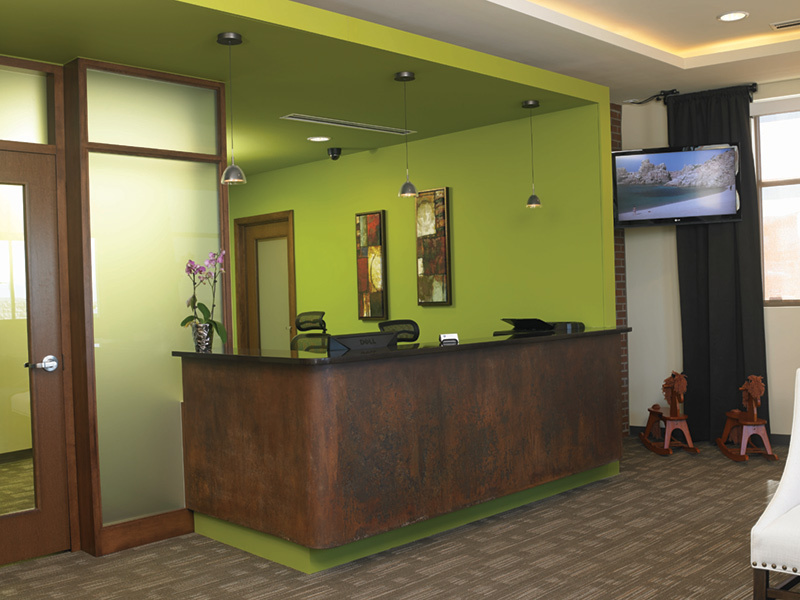 The front desk was acid-etched to match the look of the exterior rotunda and offers a dramatic contrast against the vivid green wall color. She reached out to a former Henry Schein colleague, Field Sales Consultant Jason Hershberger, but this time as a customer. Dr. Williams also attended Driven to Excellence, a dental office design course offered by the KaVo Kerr Group to Henry Schein customers. This program, led by renowned dental expert Dr. Mark Tholen, provides a “boot camp” on essential information and decisions that need to be made when building a new office. Custom-etched glass panels visually mark each operatory, and beautiful pendant lighting and carpeting fill the hallway. The first decision the doctor made was to construct a modern office that would stand out, but still feel warm and comfortable to patients. The building is architecturally compelling, with a dramatic rusted-metal rotunda that dominates the entrance. The unique check-in desk, which was one of the more challenging pieces to bring to life, ties in the rotunda to the waiting area. To achieve the rusted look, the metal facing was exposed to acid. “The metal turned gray, blue, green… it seemed like every color but rust. Just as we were about to give up on it, it all came together and looked perfect,” she recalls. The color palette in the carpeting, upholstery, and walls is bright yet soothing. 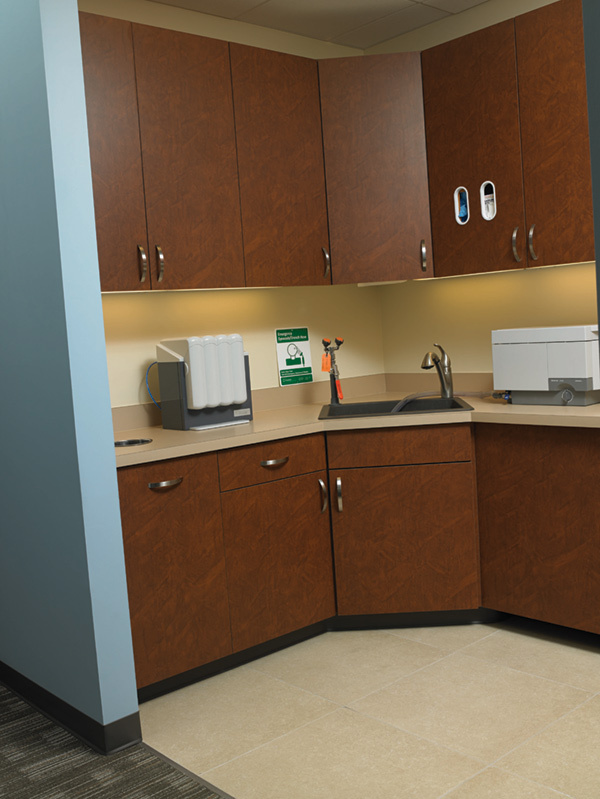 Soft blues, cream, and chocolate brown are prominent, but a vibrant pop of green welcomes patients as they come in. 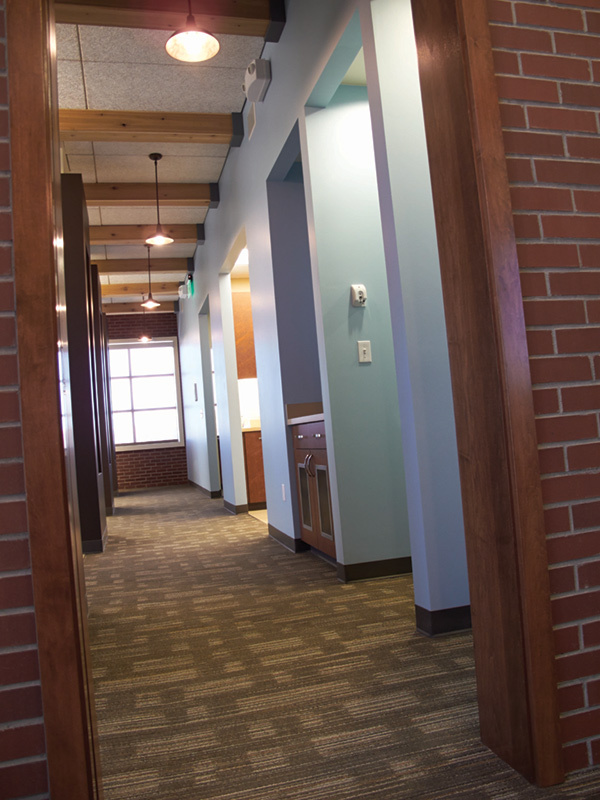 Exposed brick walls and the thick cedar beams that line the ceiling create a feeling of warmth in this modern office. In the hallways are custom-etched glass panels that visually mark each operatory and create energy in what would otherwise be a stark corridor. The operatories are spacious, bright, and have clean lines that create a feeling of calm and comfort. The doctor opened the practice with two fully equipped operatories. In the first year, she built out two additional operatories and is already planning to complete two more, bringing the final total to six. All of them are designed identically, with Pelton & Crane cabinetry, Spirit 2000 delivery systems and Spirit 3000 chairs, and Helios 3000 LED lights. The doctor and her staff use KaVo handpieces and SOPROLIFE intraoral cameras, and Accutron nitrous oxide is plumbed chairside into each operatory. 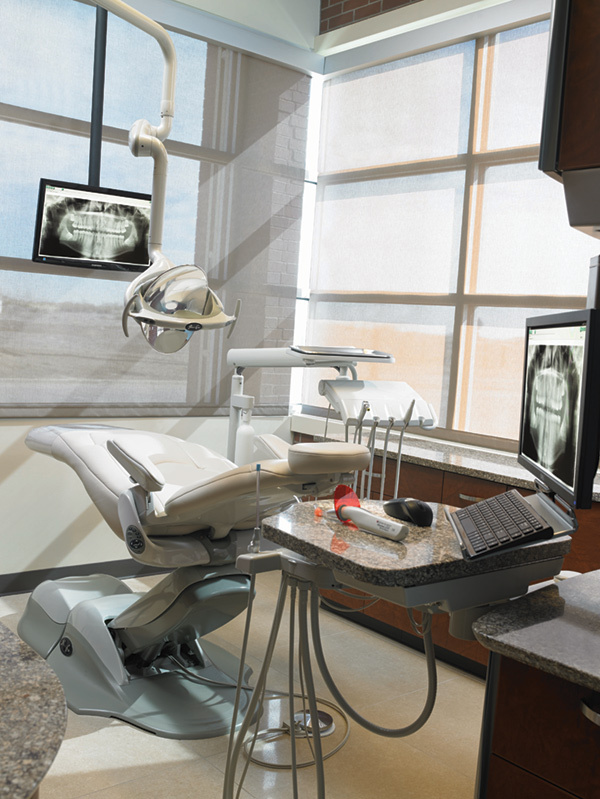 Patient imaging is performed with a Gendex GXDP-300, Progeny X-rays, and DEXIS sensors. Online Pandora Radio music is wired into each luxurious chair, a very inexpensive addition by Dr. Williams that has earned rave reviews. Patients absolutely love it! “People love the location, the hours, the time that we spend with each patient, and they are quick to mention that our office is beautiful, comfortable, has massage chairs and streaming music, and really friendly people there to treat them,” Dr. Williams says. The efficiently designed sterilization area allows greater production and convenience for the staff. It was important to Dr. Williams to have the most modern technology in her office; in her nonprofit work, she had experienced how certain limitations could impact care and growth. 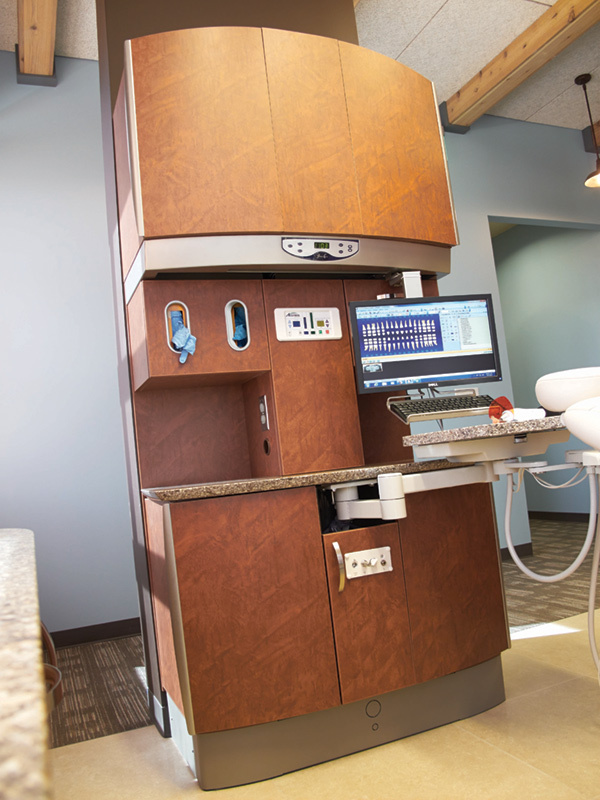 She enlisted Henry Schein’s eServices to create the infrastructure for a digital office that would also position the practice well to add new technology seamlessly in the future. “Being paperless was a key feature from the start,” confirms Dr. Williams. “We utilize our Dentrix software in every possible way we can, including having patients fill out and submit their forms online prior to their first appointment. There is no e-mailing or paper forms to print or scan.” First-Year Success Lays the Groundwork for Future Growth For the past six months, Dr. Williams has added an average of 74 new patients per month and is poised to continue that successful growth.